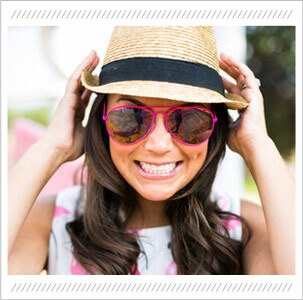 Hi there - I am so excited to share this post as a Capital One Partner!! I know, I am just as shocked as you must be to hear from me so soon! I think I must be getting my groove back (hopefully!). I say that, and I am sure tomorrow will not go anything as planned. Since Lily was born I feel like we have been burning the candle at both ends. I know it should be expected as a new parent to feel a little tired and busy, but I am learning something new everyday as a new mom and a new business owner and the learning curve has been crazy the last few months with both. So I was thrilled when Capital One invited me to Grandoozy to experience their Destination Venture Dome and to have a parents night out on them. Jonny and I have been pretty lucky and Lily has been a very easy going little lady and we have been able to go out on dates with her (quite a bit) since having her, but this was our first night without our little gal. It was hard, but also nice to have some grown up time! We had planned to leave her with my mom for the night and ended up all spending the night over there because we couldn’t be away from her all night. Jonny and I always love spending time with Capital One. Last year we learned so much managing our finances as a couple at the Capital One Cafe and this time we had a blast figuring out what kind of vacationer by taking the Venture Card Quiz…. shocker I am a “relaxationionist” and Jonny is an “adventurist”. We got to hang out with Ben from The Bachelor - a few of you asked if he was nice. Yes, he really was! Jonny and I are hoping to make it to the Venture Dome as it comes through town a few more times with a few more exciting guests! January 5th through the 6th at Skyline Park. It has been a LOOOOONG time. Life looks a whole lot different than when we last talked. A little more chaotic, but oh-so beautiful! I am not going to lie. Sitting down to write this first post since my long hiatus from my blog has been so hard for me. I have been avoiding it for weeks. Lie - months (annnnd months!). The more I have avoided it, the harder it has gotten. Do you all have anything that you are avoiding? Working out? Laundry? Also two things I have not been great at lately- yikes (new mom life)! To be honest, I have missed sharing and connecting with you guys…. but as you can imagine, things got a little crazy starting a new business a few months before the arrival of our first baby. How many of you thought I was nuts to open a store when I was 6 months pregnant, but were kind enough to not say anything, raise your hand?! Well thank you all for supporting us these first 6 months we have been in business at Denver Darling Boutique. It has been a whirlwind. And these first (almost 4) months of motherhood have been nothing short of magical. Exhausting. Educational. Sweet. Sometimes scary, but so beautiful. I can’t believe that almost a year ago we were just finding out that we were going to be parents. I had never shared with you all, but we weren’t sure if it was even in the cards for us. After getting off of birth control in 2016 it took me almost 8 months to have a period and after a ruptured ovarian cyst I finally had another cycle a few months later, but never anything regular. Jonny and I were starting to wonder if something was really wrong (I guess 1 in 8 couples is affected with infertility). I talked to my doctor and they suggested that I start taking a medication called Clomid to increase my chances of getting pregnant faster. Jonny and I decided that we wanted to instead look into the root of the issue before I started taking medication too quickly. Luckily we live near one of the leading fertility clinics in the North America CCRM which I had heard great things about from several friends so we decided to make an appointment. After filling out an extensive medical history for both Jonny and me we had our consultation (on our anniversary coincidentally). CCRM developed a custom tailored plan for us to help ensure the best outcome possible. CCRM is known for offering prospective parents the fastest path to the healthiest baby. If you know me personally, you know that I am a big time worrier. So after leaving our consultation, in addition to our plan with CCRM, I told Jonny that I wanted to exhaust other areas of medicine (I hate taking medicine if I don’t need to) so I made another appointment with an acupuncturist that another friend had suggested True Mind Center for Traditional Chinese Medicine. I went to three acupuncture appointments and the day before my next scheduled appointment at CCRM (on my Papa’s 92nd birthday) I found out I was pregnant!! I love acupuncture - will be sharing more about how it helped me with pregnancy and after soon! We were shocked! Since I was not having regular cycles, it was impossible to tell how far along I was so I immediately called CCRM to discuss next steps. They got me in for an appointment immediately and held our hands until they knew that it was safe for me to move on to my normal OB/GYN. For women and couples experiencing infertility I recommend contacting CCRM. It can be a scary and complex topic and CCRM aims to empower individuals and couples to make informed decisions that can positively impact their future. Right now, Colorado residents can take advantage of CCRM Colorado’s Fertility First package which is a 15% off discount on a fresh or frozen IVF cycle to first-time IVF patients at its fertility center in Lone Tree, CO. More details can be found here. Thanks to Jenna Sparks for some of my all time favorite pictures!! Would love to hear what you all would like to hear more about. I am an open book and can’t wait to share more with you all. I feel like I have been dropping a lot of big news on you lately... but I have more! It's all been a lot for me to take in too, but every bit of it is incredibly exciting. I knew 2018 was going to be a year of wonderful things and big change, but I had no idea how much so! Our little Miller family is growing this summer, and before then, Denver Darling is making some big time changes too! We are opening our first storefront in just a few short weeks!! For local friends it is in Cherry Creek North (on 3rd between Columbine and Josephine) and non local friends we will also be online soon! Around the time I first started blogging (almost 3 years ago... yikes! ), my dear friend (now business partner!!) Molly Fortune, mentioned that we should someday open a store. It would focus on classic, feminine clothing like we both love, at an accessible price point and unique gifts... a one stop shop, if you will! We developed the concept over countless brunches and happy hours and always saw it as kind of a farfetched idea. After 14 weddings and countless events last summer that left me rummaging through my closet and online dress binges at 12:00am only for them to arrive and the quality to be poor - color wrong - and fit off; which would lead to a busy day of last minute shopping that I just didn't have time for only to go home and settle on an old LBD from 8 years ago. I started thinking that we were really in need of a store that catered more to the young woman with a busy and fun loving lifestyle in Denver. Molly and I started hearing similar stories from a lot of our friends and began thinking more seriously that we may be in need of a shop that carries more classic clothing and occasion dresses for every event that may pop up (brunch - black tie and everything in between) and an assortment of unique and fine gifts for the bride, baby or hostess to make life easier on us gals with limited time. We still had sort of a 5 year plan in mind when we stumbled on the perfect place. A little house in the middle of Cherry Creek, and we knew it was the perfect place to take the leap and call it Denver Darling's first home. In addition to a space to house apparel and gifts, the outdoor space and upstairs area provides a unique venue that we hope to share with friends and nonprofits that we love for special events. We are not sure what we we were thinking, but neither Molly or I got before photos of our little house #badblogger, but here is a photo of my dad taking snap chats (he crushes snapchat) of the original and our new paint job. We are thrilled with how it is coming along! We obviously still have some work, like signage and new awning, but it has come a long way in a short time. We have a few more updates before we open in just a few short weeks and now that the secret is out I will definitely be sharing all of them with you as they come along! I shared a few sneak peeks of things we will be carrying in the store over the past few days (below too!)... I would have loved to preview a cocktail dress or two, but things just don't fit the way they used to right now ;). I am wearing a gown that we just got in assuming I don't grow too much between now and then. We would love to hear what brands you love and things that you would love us to carry as we get started! Wish us luck!! We will be sure to keep you posted these next few weeks with all of the details!! Can't wait to see you all in the store soon! It's been a minute, guys! A lot has changed since I wrote my last post... and if you follow me on instagram or facebook, you know that Jonny and I are expecting a little girl in June (this is a mocktail in my hand (btw)! We are OVER THE MOON excited and can't wait to meet the little lady. I have to admit, posting during my first trimester was hard and became nearly impossible because 1) I felt like crap and 2) I am not the best secret keeper (especially when it is super exciting news!). I am so used to sharing everything in my daily life with you guys and I felt like all I wanted to do was ask for advice and shout our fun news from the rooftops and since Jonny and I decided we were going to wait until after the first trimester to share the news I really just shut down and felt I couldn't write at all. Not to mention, it was a little hard to want to prepare for shoots when I'll I wanted to do was be in my bed, watching bad TV during most hours of the day and eat nothing but clementines during my waking hours. I am now 20 weeks and I seriously can't believe that we are already half way there. Although the first trimester slowly ticked by, since week 12 I have felt great and it feels like I blinked and we are half way! Baby (we call her Booglet) and I both grew a lot last week and I felt her first kicks right after our ultrasound last Monday which was the most bizarre and incredible feeling all at the same time. She is growing and I plan on doing a much better job documenting the second half of this incredible time in our life and I am certain that I will have some questions that you will all have tips for a first time mommy like me! I am so excited to share some more big news in my next post - I am embarking on another huge adventure and cant wait to share the exciting news with you guys!!! Hint the Denver Darling family is growing too :). Any guesses? A few weeks ago, Jonny and I joined our friends for a ski weekend in our favorite ski town. I have shared a few other Vail guides (here and here). We spent the weekend at the new Hotel Talisa which was the perfect ski in ski out spot for the guys and the perfect place for me to relax with plenty of snowshoe trails for me and Stanley. We used to visit this same property as a family growing up, but it definitely did not look like this. The Hotel Talisa gave the old property a complete update and refresh - the rooms are so comfortable and spacious and we all enjoyed some of the most delicious meals that we had ever tasted. I think you can truly the quality of a hotel by the extra touches put into the room and being pregnant I go to the bathroom about 25 times a night and I was so pleased by the automatic/nightlight features in the bathroom so I didn't bump into things every time I got up (it's the little things guys). The Hotel Talisa is located just outside of the main village and they have a shuttle running constantly between the hotel, Lionshead, and Vail Village. We rarely used the car throughout the weekend because parking in the village can be such a pain and the shuttle made it super convenient. I had a ton of questions about this stay and hope I answered them all!! We truly had a blast and can't wait to go back. I also got this poncho last year, it is perfect for a mountain getaway (and pregnancy!) - it is sold out, but love this one, this one and this one too! And so far these jeans have been my only maternity splurge (thanks mom!) and wear them all of the time. I am so happy to that the sun is finally shining in Denver!! Last week was freezing and reminded me that I never shared our sunny trip to Scottsdale. Last month Jonny and I were supposed go on a two week European tour (our second attempt at the trip), but #life and we had to cancel again. We were both incredibly bummed and knew we had to book a trip right away. Not to mention we were about to have our first snow in Denver and neither of us were ready for it. We quickly looked at easy trips from Denver and knew Scottsdale would be the perfect place to lift our spirits and escape from the chilly early winter weather. I have visited Arizona a few times, but everything about this weekend was completely unexpected and Jonny and I fell in love with the sunny city at every turn. I arrived a day earlier than Jonny, and started the long weekend at the Omni Scottsdale Resort and Spa at Montelucia. I was in total awe the moment I pulled into the driveway at the Omni. Honestly, I should have researched the hotel better because I had no idea what an incredible resort it was. 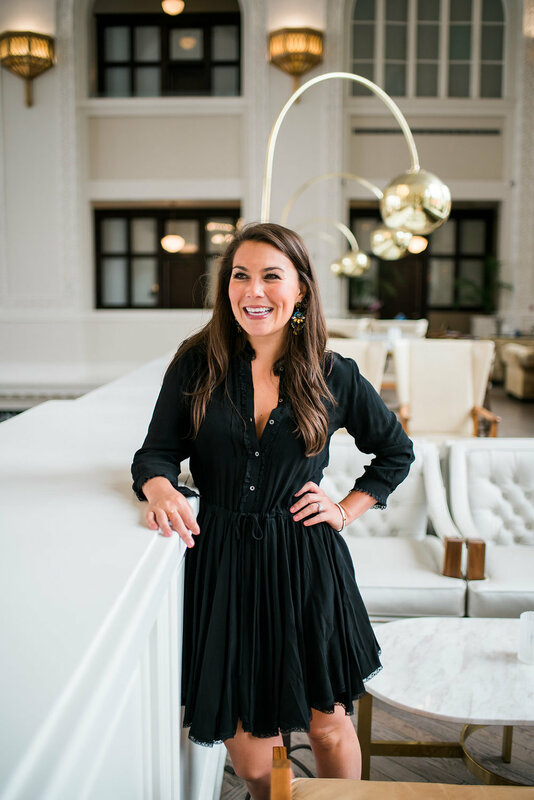 We have several hotels with the same ownership here in Denver so I pictured something more business and conference like - when I say I was in awe, I was truly amazed by every little detail of the gorgeous property. They have several delicious restaurants - I highly suggest the "Tapas Experience" at Prado. After getting in pretty late, I wasn't sure I wanted to have a big dinner and the small plates at Prado were the perfect late night treat! I got up bright and early to take in all of the beautiful sights at the Omni - and again was surprised when I stumbled upon an outdoor spinning class overlooking Camelback Mountain. I am always able to relax more when I get a nice sweat in - and I had big day of relaxation ahead of me! After the gym, I headed to the Joya Spa, which I can easily say is the most creative and one of the most beautiful spas I have experienced. The staff ensures you are on a relaxation journey right from check in - and even stopped to remind me to set my intention at a giant crystal upon entering the spa area. After my Hammam scrub (so cool), and massage, I sat poolside all afternoon long on the rooftop of spa and enjoyed a delicious lunch. It was truly heavenly. I finally (reluctantly) left the spa and packed up to go to our next hotel for the weekend, Mountain Shadows, which was just down the road. I really did not want to leave, but was again wow'ed when I checked in to Mountain Shadows. From the front the hotel isn't very flashy, but everything on the inside is sleek, classy, contemporary and and truly stunning, and the staff was over the top friendly! It is really hard to say which hotel I liked better because they were both amazing. I met some local friends for wine tasting on the Scottsdale Wine Trail that evening, which was such a fun way to see the town. We landed at FnB - a hidden gem, and local favorite where Jonny met up with us for dinner (starving just thinking about it!!). The food is fresh and flavorful and I loved meeting owner and beverage director, Pavle... he shared his delicious wine that he curates himself which was so special! There is no way Jonny would let me get away with planning a warm weather trip without a little golf, and although Mountain Shadows has a beautiful 9 hole course of its own, Jonny was dying to play at The Boulders about a 30 minute drive from town. We enjoyed a delicious lunch with a view at The Grill and then toured the property, even saw a bride and groom taking pictures before heading back to get ready for a memorable dinner at the Fat OX. Jonny and I thoroughly enjoyed ourselves at Fat Ox - 1 bottle of wine turned to two and we ate our weight in tiramisu. Such a fun date night spot!! We planned to leave late on Sunday so we could enjoy a full day of fun before heading home to the snow and we were so glad we did. Arizona Outback Adventures picked Jonny and me up early for a kayaking tour down the Salt River. It was such a great activity and way to see the beauty of Arizona in such a fun way. Our tour guide mentioned that we may get lucky and see some wild horses on our trip... and to our surprise I almost ran right into them as they were crossing the river... such a cool experience! After returning from our excursion we enjoyed the gorgeous Mountain Shadows pool in one of their poolside Cabanas for the rest of the afternoon. It was the perfect spot to spend a Sunday - I could relax in the pool and Jonny caught up on football since there were TV's in each cabana. I was thinking this would be the perfect place for a bachelor/bachelorette party! Before leaving for our flight we had one last amazing dinner at Hearth '61 which is conveniently in the hotel and overlooks the gorgeous pool. We honestly thought about staying an extra night because we were having so much fun. As I type we are planning our next trip and can't wait to get back there!! This post is in collaboration with Experience Scottsdale. As always, all opinions are my own. Thank you for supporting the brands that make this blog possible! Hope you all had a wonderful weekend and start to your week. We had such a relaxing/low key weekend with zero obligations and it was exactly what I needed. The past few weeks have been busy. Packed to the brim with travel and fun celebrations that I can't for one minute complain about. But sometimes a weekend in with Jonny and Stan and homemade soup from my momma is just what the doctor ordered. Because I am a lady in 2017 date night no longer fits one mold. Staying home and cooking with my boys or ordering takeout so we don't have to clean up the mess gets me just as excited as dressing up for a night out. 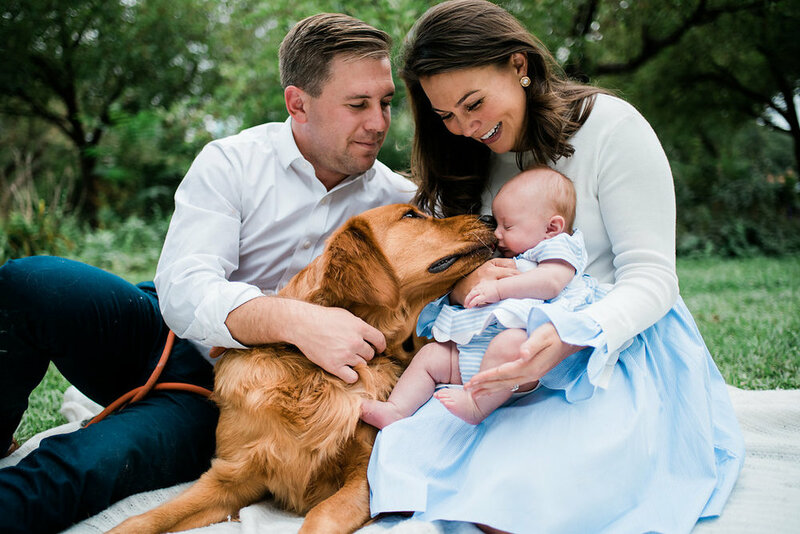 I love that Talbots its promoting real women in real life with their #BecauseImALady campaign because life isn't always exactly the pretty picture we paint on intagram (says the girl sitting in her mismatched p.j's as she types). I think it is an important message. They are also having a huge friends and family sale and you can get my whole look for 30% off! I have been living in these leggings - I am always so pleasantly surprised when I put on a pair of petite pants and they just fit perfectly.... no alterations need, woohoo! And these hit right at the ankle and are thick enough to wear to work, and thin enough to go in a boot. My coat is the perfect fall staple with a little feminine flair! I love the ruffle detail on the front that makes it unique from my other camel coats (#cantstopwontstop my camel coat love affair). Jonny and I do have a big night out planned for later this week and hope you can join us! I have mentioned a few times on social media that I am co-chairing a new event, Rev The Runway, for National Jewish Health on November 2nd. It is going to be a fun night with lots of food, fashion, delicious cocktails and a great live and silent auction all going towards a wonderful cause! Hope to see you there!! This post is in collaboration with Talbots. As always, all opinions are my own. Thank you for supporting the brands that make this blog possible! It seems like I have been traveling as much or more than I have been home this summer, so I have really had to change my perspective when it comes to "routine". I used get a little crabby if I couldn't make it to my class that I had planned or a workout with a friend, because my schedule has been all over the place I have had to adapt! The last few weeks especially, I have received a ton of questions about how I workout when I am on the road. My big secret... I try and stay as active as possible. Truthfully, I feel like I am always more active when I am away because I want to explore. I also indulge more so know that it is important to get a few more steps in. I read something recently that said, "Count memories, not calories", and every time I felt a tad guilty eating that gelato, I told myself... F it - I am making memories here! When we are traveling our routine looks a little something like this: Jonny and I usually have a light breakfast while we both catch up on work, then head out for a walk or run. When I am running in a new place I always surprise myself and can go so much farther because I don't know the route or trail and have less expectations when I start out. When we were in Aspen I took Stanley on a loop every morning that I found out was double the distance of my normal runs (and at altitude!). During our trips Jonny and I try and get at least 30 minutes of cardio in, and more if we know that is going to be the only exercise that we get for the day. If we are going to be sightseeing all day long, we might attempt to walk ourselves through a yoga flow or follow a fun youtube video. My mom got me hooked on these dance videos (I am awful, but they are a blast), and Lacey showed me these when we were in Mexico which are great 15 minute workouts. These are some shots from our ladies day out when Ali was in town. Lacey and I had so much fun showing her around to some of our favorite spots... and attempting cartwheels for the first time in probably 15 years. We are wearing the silkiest leggings I have ever put on. These Ultracor leggings are so soft that you feel like you are actually naked. I love the fun designs and each pair has built in underwear! They are a bit pricier than your average workout legging, but they definitely stand out! Be sure to pop in to Garbarini to take a peek at this line for yourself! Wow, am I glad to (see) you!! I tried to get this post up last night and my site was down for about 15 hours so thanks for your help and understanding, especially since things have been a little slow the last week while I was enjoying time with my family in the mountains. Every time I sat down to write a post all I could think was: I need to be outside with Stanley breathing the fresh air, soaking in every minute with my people, and enjoying the mountains. And the 8 year old in me just could not sit still longer than 5 minutes to get a post out. But HIIIIIII, I am back!! I missed you all and can't wait to share more about my trip later this week. Before heading to Aspen I spent the day with two of my favorite blog friends - Lacey, who you all know by now, and Ali, one of the lovely Chicago ladies Lacey and I met on our trip to Mexico last spring. I've said it before, and I'm sure I'll say it again (a million times) I am so thankful for all of the people that blogging has brought into my life. First of all, all of you! And the wonderful friends that I wouldn't have met otherwise. We partnered with Garbarini, one of the oldest, high end boutiques in Denver to share some dresses that are perfect for this awkward time of year... when it is too warm for fall clothes, but their is a hint of the season turning. I'll be the first to say it, I was not "wow'ed" by my dress when I first saw it on the hanger. You probably know by now, that I am drawn to bright colors and pretty patterns. However, once I put this dress on I changed my tune... I love the feminine fit and flare and the ladylike lace trim and the fabric is perfect for these transition months. My exact dress is available at Garbarini, but I also love this $37 option and this one too! Ali and Lacey are also wearing dresses from the same designer. I love the patterns, and flowy - lightweight fabric of both of their dresses. They would be perfect layered with this $98 leather jacket as the days cool off, and great simply paired with a pair of fun earrings (I like these!, these and these) until then! Get all of our looks at Garbarini (they ship worldwide!) or scroll the gallery below. This post is in collaboration with Garbarini. As always, all opinions are my own. Thank you for supporting the brands that make this blog possible! I know, I know, I am a day late - but still, a new month always feels like a time to celebrate and hit the refresh button. Yesterday, a friend of mine said that August is like the Sunday of the year 😂😂😂... I get it, it means summer is coming to an end (but not for a while!). I am hosting an event with J.Crew tomorrow (August 3rd) at Cherry Creek from 6-8 to preview some of their pre-fall collection and show you how I transition my summer wardrobe through these next few months! They are offering an additional 20% off of a $125 purchase to Denver Darling guests!! I wear white jeans all year around. I would say my white jeans are easily the thing I wear most in my closet, and I just bought these because as you have seen here, here, and here - I get a lot of use out of my white denim (especially during transition months!). I thought this top would be perfect for our (quick) trip to Italy later this month. The embellishment is so pretty and pretty much the exact shirt I would draw up for myself if I could! BTW, since last week, we have decided to still go to Italy for a few days to see our friends get married - the jet lag is going to be REAL, but we are still so excited and are planning to finish our original trip at the end of September. For sizing: I got this top in a 2 and have a similar top in a 00. I like the looser fit of this top, but if you are looking for a tailored fit size down. My shoes are from a new site (Guilty Soles) - I have a few pair from them and have loved them all, but they run a bit big! I would say size down at least a half size. Hope to see you all TOMORROW for a little shopping fun drinks, and treats at J.Crew Cherry Creek!! This post is in collaboration with J.Crew. As always, all opinions are my own. Thank you for supporting the brands that make this blog possible! Last week Jonny, (Stanley), and I had an extra special date night and the opportunity to experience the new Hotel Indigo Denver - Downtown. It was our first full week in Denver in over a month so it made date night and playing tourist around Downtown that much better. Jonny and I live just west of Downtown (in Lohi) and rarely cross the highway because many of our favorite date spots are just around the corner from us, so even just the small (8 minute drive) distance was a welcomed change of scenery for our little staycation! 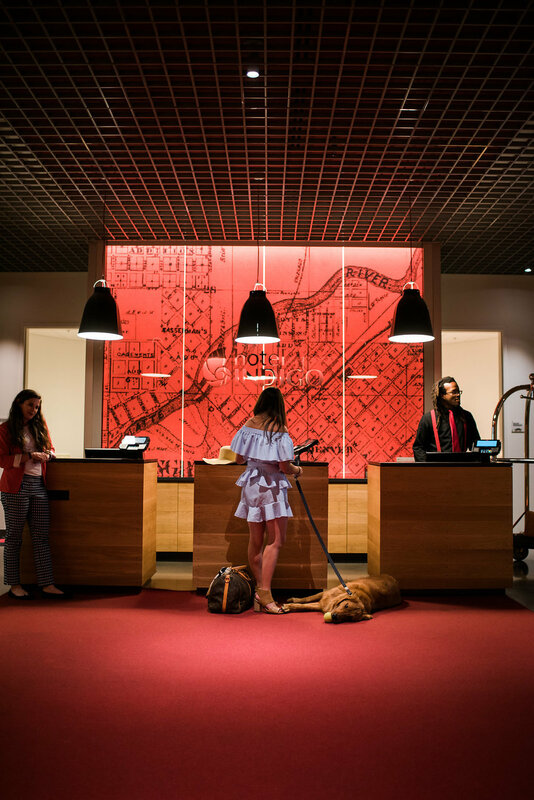 Anywhere there is a hotel greeting dog you can bet it is going to be on the top of my list of favorite hotels, but when it is a Golden oldie like Sir Charles Barcly and his job title is "Hotel Ambassador/Greetings Guru" I knew I was going to love Hotel Indigo that much more. The staff could not have been more accommodating and eager to make our stay wonderful even though Stanley was a bit on the rowdy side at check in (#typical)- they welcomed him with open arms! PJ's old (Forever 21) similar options here, here, here! 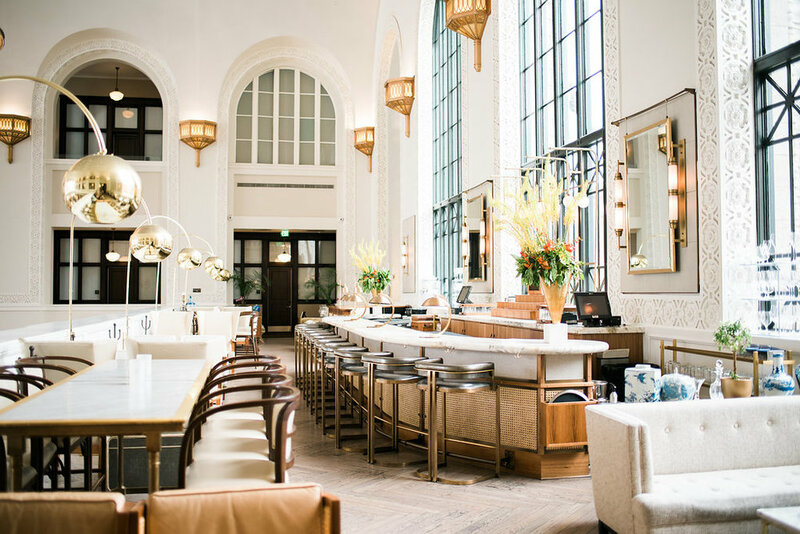 As I mentioned, we live a stones throw from the hotel, but once we arrived we were able to forget about our car and check out some of our favorite spots that we don't get to often enough Downtown - like Union Station. Hotel Indigo's central location is ideal if you are visiting since it is in the heart of Downtown and most of the major attractions are within walking distance. We are currently researching spots for our trip to Europe next month and walkability is always the most important thing to us! 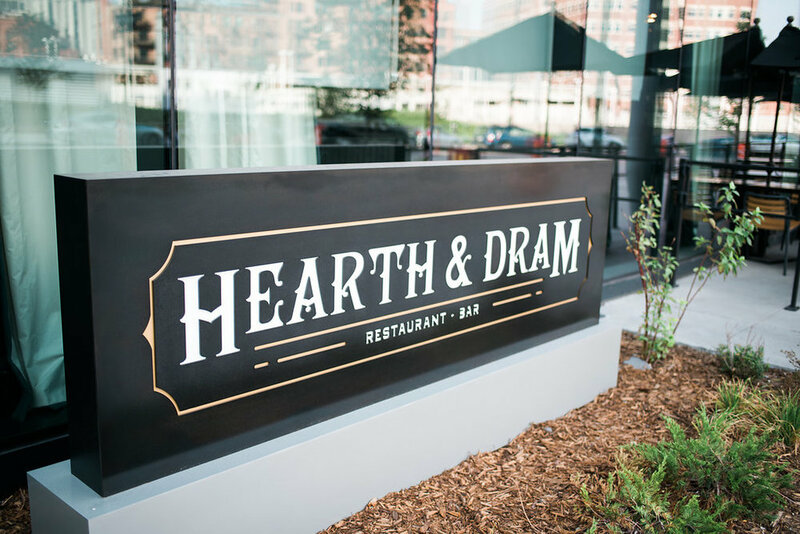 I have been hearing rave reviews about Hearth and Dram since it opened, but had not had the chance to try it! I knew it was near the hotel, but did not realize it was directly through the lobby until we arrived (not sure why I did not put the two together)! It may have been a little too convenient as we ended up having drinks there once we arrived and then I met Lacey and our friend and photographer Jenna there for lunch the next day. We enjoyed ourselves so much that lunch turned into happy hour - 4 hours later. I would say that is definitely the sign of a successful and delicious lunch! The drinks were so creative and we were all impressed by the pretty plating (food wise and actual plates). My favorite thing we had was the salmon appetizer and I was not even remotely excited at the idea of ordering salmon over cheese, but I can't stop thinking about it! If you find yourself in Denver I can't recommend Hotel Indigo enough. The whole experience was wonderful from start to finish and we can't wait to go back! This post is in collaboration with Intercontinental Hotels Group . As always, all opinions are my own. Thank you for supporting the brands that make this blog possible! I braved the crowds yesterday - and seriously have never seen anything like it in CO! I went to opening day of the Anniversary Sale last year in Chicago, but figured that was just how the shopping experience was there most of the time. When it comes to shopping in CO people usually don't get too crazy over department store sales, especially on a Thursday morning in the middle of summer. I think we are such an active state and people prefer to get in and get what they need and get out, or shop online. But yesterday was insane! No parking anywhere (11:00 am) at our biggest mall with miles of parking, long lines at each dressing room, and long lines waiting for each register... an absolute mad house, but I loved it! Thankfully, I have made friends with the sweetest girl who is doing a styling internship at Nordstrom and she pulled a few things she thought I would like before I got there because I would definitely have missed something! I had planned on walking you through my purchases on my instagram stories, but I felt awful taking my time and chattering away on my phone while the line was out the door for a room, so will go through my picks here! I thought this dress would be perfect for our trip to Europe next month! It is super comfy and plan on wearing it with sandals and wedges! Last year a bought a similar blush top at the Anniversary Sale and wore the heck out of it. Blush is my favorite color so probably have a few too many of them, but they always get worn and this one is under $50 and gorgeous fabric so knew I wanted to try it asap!! I am wearing a small, but ordered the XS for size reference. Obviously needed a blush pump to match - and these are so comfy $79.90!! I don't work in a formal office setting anymore, but if I did, this dress would have been my first purchase! The fit is amazing. I love when a shift is just the right amount of tailored and the ruffle trim is so pretty. Sitting here trying to find a reason I need to get this dress now... hmmm. I am a sucker for a cute graphic tee and this "Pardon My French" tee $25.90 was too cute to pass up! I have the old version of this blazer (5 years going strong! ), it is such a great staple/investment piece and it and right now it is almost 50% off. These jeans may have been my favorite purchase! Because I am on the shorter side (5'3) it is hard for me to find jeans that hit exactly where I want and I love the frayed edge on these! The piece I get the most questions about is a good leather jacket! So the sale is a great time to splurge on a great leather jacket or find an adorable faux! I did not love the fit on this one, a little long and big in the shoulders. I wanted to try this one $64.90, but could not find it in store so will be ordering online! I like a more cropped/fitted look. Also like this one, and this one. I was so excited to try this dress $65.90 on because I saw it online and finally found it in the store. It was a little long on me, but is a great now and later dress! Buy now, wear with wedges and wear later with boots! I am wearing a small here. I love the fit of this top $69.90. Perfectly cropped and the bell sleeve isn't too outrageous like some bell sleeves can be and the floral print is just so pretty. This top $58.90 was my surprise purchase! I walked by it a few times not thinking it was for me and decided to give it a shot... Honestly it reminded me of Cher in Clueless, but once I put it on I loved it! It also comes in navy with stripes (but sold out in the store I was at), and maroon and white. I am wearing an xs for size. Let me know if there is anything else you would like me to cover specifically! I will continue to update the Anniversary Sale Shop above! Have a great weekend! What is the Anniversary Sale? 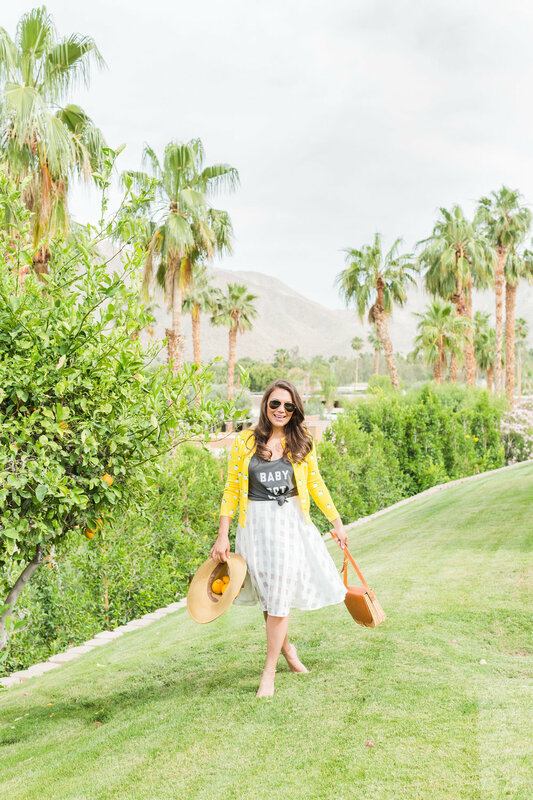 There is always a lot of hype around the "Anniversary Sale" and that is because it is one of the biggest sales of the year put on by Nordstrom. 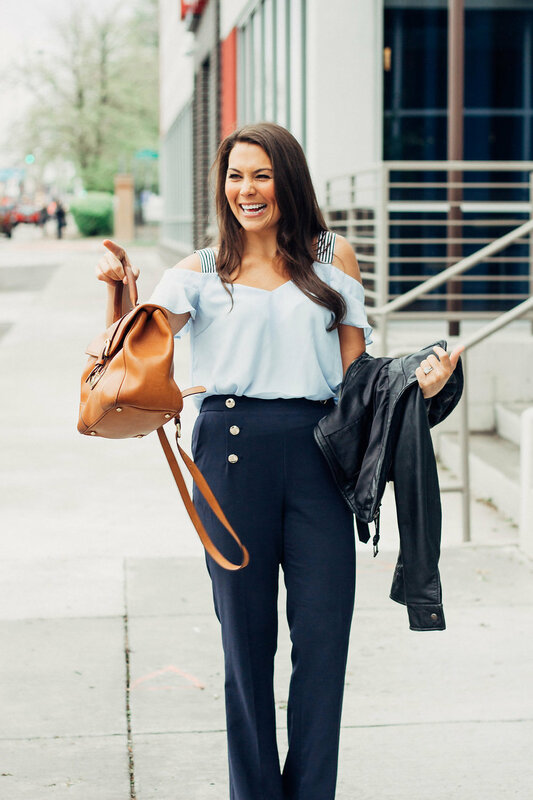 If you have been following for a while, you know that I am Nordstrom lover - and the Anniversary Sale offers a chance to preview and grab fall staples at a fraction of the price... score!! Early access for Nordstrom card holders begins today - July 20th and is open to the public after that through August 6th (but the hot items go quick!!). I will be updating my Anniversary Sale Shop at the top of the page throughout the sale so be sure to check back! And tomorrow will have a few shots from my try-on session and picks today. Jonny and I have been away from home A LOT recently... and him even more than me since his job has him traveling frequently during the week. As I mentioned last week, we decided to make some updates to our home to make it... more homey. And our bedroom has become such a cozy and relaxing retreat for us to come home to. After living together for 7 years and in our current home for 4 we decided it was about time we upgraded our furniture. I know, what you are thinking... about time, right? However, the bedroom furniture we had was... fine(ish). But we have been so happy with the change and I actually understand the people that say their bedroom feels like a sanctuary because their is literally no place I would rather spend my time than our updated bedroom. When I posted this picture on instagram - I got a lot of questions about the specifics of our bed, and bedding so wanted to be sure to share them with you! Our bed is the Regina from Joss and Main it also comes in 5 other colors (including pink!) and they carry the same style at Wayfair. I love the tufted style and searched all over the perfect one. I do also love this canopy style, this taller frame, and this pink bed! We got our bedding as a wedding gift almost over two years ago, but we are just now able to use it because we ordered everything in a King and our old frame was a queen. Going from a queen to a king... O.M.G. its the best! And it is so nice to finally use our bedding that we have been saving. Also, we chose to register for colors that were timeless and gender neutral and still available here almost three years later!! I love that our quilt that we keep folded at the end of our bed, it has such pretty detail and is so soft! We chose to accent with this paisley pattern and linen Euro shams. We are heading to the mountains today for the holiday and I am already a little homesick, but excited for some fresh mountain air!! What plans do you have the holiday?!! Last week I was frantically running around getting ready for the Aspen Food and Wine Classic (ummmm take me back!!!). As a lifelong Colorado girl I had always heard about the Classic, but had no idea what to expect. Turns out having no expectations made it a million times better!! 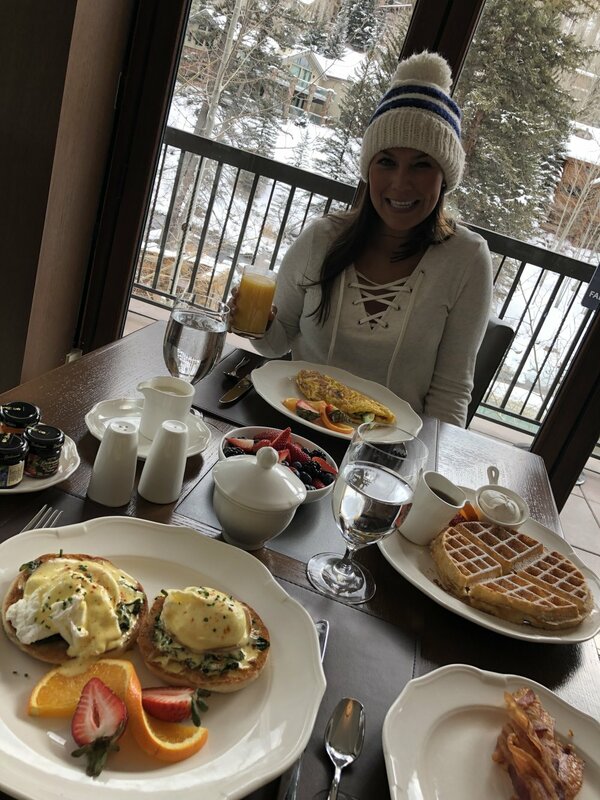 Aspen is obviously always beautiful and lovely, but add endless food, drink, dancing, farm animals and fun and it takes it up to a completely different level! For me, the entire experience was like a fairytale. Enjoying time in the mountains with Jonny, amazing friends, and all the delicious food and rosè a girl could ask for made for some incredible memories!! I am so thankful to American Express for inviting me to participate in such an unforgettable weekend! The Classic runs for three days starting Friday and events kicking off on Thursday. We didn't want to miss any of the fun so Juli and I left Denver early Thursday afternoon just in time to meet Leah for the Glenlivit tasting dinner. Fun fact, Juli and I grew up across the street from each other, but haven't seen each other in forever so we had a blast catching up and reminiscing all weekend!! It is so cool to catch up with your childhood friends and see the amazing things they are doing and she is absolutely crushing it!! Fun fact 2: I was reading her blog (Paleomg) before I knew what a blog was (seriously!). Lacey arrived late Thursday night and our whole blogger posse was complete, she missed dinner, but we were all reunited bright and early to explore the American Express Platinum House and take a pop up Soul Cycle class Friday morning. Lacey, Leah and I have been having so much fun traveling together! Remember our Mexico trip last spring and our Garden of the Gods getaway last month? Walking into the American Express Platinum House was so surreal. Mostly because I was convinced that it was held at a hotel then we found ourselves winding and weaving through an Aspen neighborhood and up a mountainside driveway to someones home. We spent a lot of our time there.... because #whynot!! They made it really hard to want to leave. We started both Friday and Saturday with Soul Cycle classes and snacks after. They of course had a DryBar pop, mani station for primping and endless food from Top Chef Stephanie Izard. Someone said it was like a grown up/ultra luxury Real World house and I think it's safe to say that was a very good comparison. After a few tastings and more fun at the Amex Platinum House we all went to the Patron party hosted at the Little Nell Residences (basically a huge dance party at the base of Aspen Mountain) - it was so much fun!! I attended another Patron party last night in Denver and I am convinced that they have the summer fun market cornered. And yes, this has been a heavy week of drinking... detox starts next week. There was a lot of eating all weekend, but Saturday there was a TON!! I attended the the Blackberry Farms x Amex Trade picnic lunch as Juli's date and wore this super light ruffle, off the shoulder dress! I changed into this maxi for the afternoon because it was a little windy and ruffles and wind are not friends. We walked all through the the tasting tents my favorite booth was the all pink booth from the JW Marriott (pictured above) and they had the yummiest drink - they were so dangerous!! I wish I could pin point one delicious food, but I cant. Cheese comes to mind for some reason. Lots of cheese. We were so fortunate to stay right in town at the Molly Gibson. Once we parked for the weekend we walked everywhere! It was so nice to not have to worry about driving in and out of town especially with our big group (4 of us + 3 spouses) - coordinating cars and meeting up would have been such a pain! The hotel prides itself on being an affordable option without skimping on amenities. I had a slight obsession with the orange cruiser bikes they have available (complimentary) for guests. I also love that they are very dog friendly and they include a yummy full breakfast every morning at both the Molly Gibson and their sister property Hotel Aspen across the street. I wore this ruffle top - wearing a small (wind had died down fewww!) to our last evening out! We saw Dan White perform the most amazing magic show ever. I was completely floored by all of his tricks. Jonny eagerly offered to participate in the show and got to be part of the finale - it was amazing. There was an after party and an after after party back at the Amex House. It was one amazing, busy, and filling weekend and I am so incredibly thankful that I got to be a part of it!! Crossing my fingers, toes, and everything else that I can go again next year with this same group of amazing people because they just made it that much better!! Napa tomorrow, friends... wish my poor little liver luck. Any and all suggestions are appreciated!! This post is in collaboration with American Express and the Molly Gibson Lodge . As always, all opinions are my own. Thank you for supporting the brands that make this blog possible! I am finally feeling rested after our four days at the Aspen Food and Wine Classic today. It was one of the funnest experiences I have had and can't wait to give you the full recap later this week, but it is always nice get home! 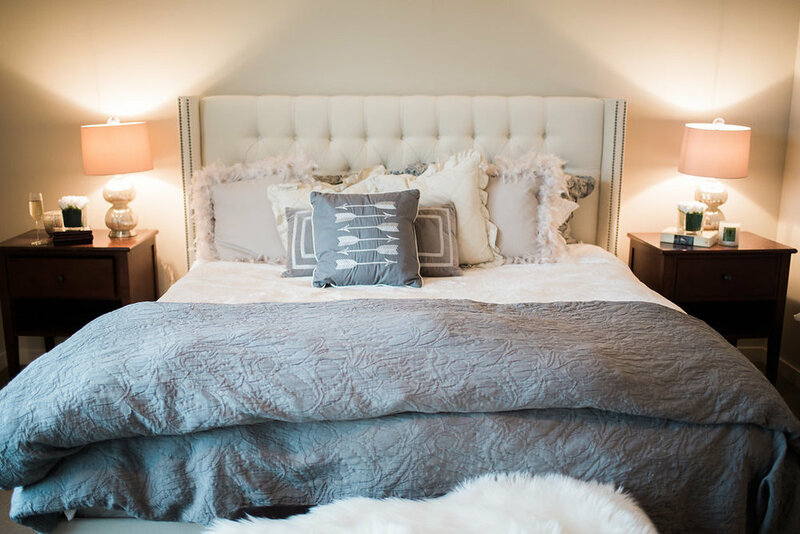 As I mentioned last week, Jonny and I are traveling quite a bit this summer and our master bedroom update has made for such a relaxing (and organized) space to come home to! Until recently, for the last four years that Jonny and I have lived in our house, my shoes scattered our closet floor and various areas of our house. Obviously not his favorite thing about me. Now I (almost) look forward to unpacking because our home looks and feels so much more organized with the addition of some extra storage. When I posted this photo of our new shoe wall on instagram a few weeks ago, I got a lot of questions about the specifics. And I wanted to share exactly what we got because we did this update for a fraction of what I thought was possible. I figured a ceiling high, book shelf would have to be custom built, which means $$$, but after a little research I found that this would be perfect! And we purchased and installed ours for under $200. We bought the $69 Billy Bookshelf from Ikea, with the $35 extender for an extra shelf and 3 extra shelves $10 each. I paid $80 for Ikea to deliver and assemble (so worth it!). If you do not have an Ikea near you, it is also available on Amazon for a bit more! I almost purchased this one originally (love the detail! ), but I love the versatility of the Billy. I added 3 extra shelves in addition to the extender on top which gives me plenty of storage. I love that you we were able to move the shelves around and have space for heels, boots, and flats. And we also made a shelf for that fits several baskets for my flip flops and slippers. These are the baskets that I have, but I LOVE these and this 3 pack is great too. Along with this $12 clothing rack I purchased that day to help with planning outfits for upcoming trips and shoots, our bedroom was instantly more organized and I can't believe that we have gone as long as we did without the extra storage (especially since it can be done so affordably!). I will be sharing the details from the rest of our bedroom update next week. And as always please feel free to send along your questions!! I am packing and planning away for a busy weekend ahead in Aspen and then a few trips in the coming weeks. I am heading up for the Aspen Food and Wine Classic this weekend - something that has been on my bucket list for a long time, so am pretty dang excited!! If you have been, would love any tips!! You may have seen this dress on my Instagram story last week as I was starting to pack for this weekend and I got several questions about it. Many of you may recognize it as the Self Portrait ($510) dress of the season, but actually it is a fantastic dupe. I am often asked what I think about Shein and similar retailers like Chicwish and I must say, that I am always pleasantly surprised with the product. In no way is the fabric quality what you would get if you were spending 5 or 10 times the price, but for trendy pieces that aren't worth the investment the fabric is perfect. When I first ordered from the site, I had a hard time believing that they were legit. With prices of dresses and tops usually below $20 it sounds a little too good to be true. However, 9 times out of 10 I have had a good experience (taking this amazing skirt this weekend, and remember this?). I have 4 rules that I use when shopping these online retailers that always ensure that I end up with good product and not disappointed. 1. Read the reviews! I know this sounds obvious, but it is so helpful in ensuring you get what you want. Usually someone has tried the piece before you and if they hated it or loved it will leave a review (see reviews from my dress here). 2. Set expectations! Know you are not getting a $500 dress for $20, but you can still find some fun/trendy pieces without breaking the bank! 3. Order early! If you find something you like, don't wait. Shipping can take a few weeks since it is coming from overseas and if it is a popular item even longer. 4. Mix and Match! Mix your new pieces with old investment pieces and no one will never know what a bargain you got! (Unless you are me and you share it loud and proud)! My dress and the original are in the gallery below (on the blog) so you can compare yourself. Hope you have a wonderful week! As you know, I went to visit my grandparents. We had the best time. Nana showed me around their property and we spent time playing cards and picking fruit from the trees surrounding their house. My grandmother is almost 89 and one of the best bridge players in Colorado. That is amazing in and of itself, but her love for cards keeps her young and she is one of the whitiest people I know. I had a quick photo shoot with a local photographer Erica (if you are ever in need of a photographer in Palm Springs - she is a doll!) and my nana asked if Erica could ever use any of my grandmothers printed pictures in her photography and on my blog, so we said she should hold her photo (above) so I could be sure to include it in the post :). I have more of these Jackie cardigan sets than is probably ok to admit, but I think they get the more use than almost anything in my closet. I wear them mismatched like I did here or as a set for luncheons and meetings. This cardigan comes in an adorable set and has just been restocked in all sizes! I also love this original plain cardigan that comes in 13 colors and on sale ($29-$49). One of my other favorites is also on sale with limited sizes available - I wore it (here and am wearing an xs). My skirt is old and one of my go-to summer pieces. I found similar options here, here, and here that would be perfect for casual brunch or date nights. My tank is from local boutique Inspyre - (they have great graphic tees!). And you can still get my wicker and leather crossbody here - it is the perfect size if you have a summer vacation planned! You know who got a hold of mine (seriously nothing is safe with Sir Stan around! ), will be getting another one for our upcoming trips. Last week was an absolute whirlwind! I was playing catch up all week from my travel the prior week on emails, meetings, calls, and events. Sometimes I feel like going out of town can be so stressful because I have so much to do when I get back. The house is a disaster, my suitcase has exploded and taken over our bedroom, and I always have to retrain my body to get back on a regular workout routine (thats for a whole other post). Luckily I had carved out a little time for fun in my schedule - and the grand opening of the Alamo Drafthouse did not disappoint! When Jonny and I first started dating we saw a new movie every week. As our schedules have gotten fuller, we are pretty picky about how we spend our time and until now have not had the option to enjoy dinner AND a movie in the same venue unless we drive at least 30 minutes from Denver. So I could not be more thrilled that their is now an Alamo Drafthouse (Sloans Lake) so close to us. I bumped into a familiar face (Lacey from My Boring Closet - you met her here and here), at the grand opening and before exploring the theater, we were greeted by some rapping magicians on a tilt-o-whirl tuk tuk (I think??)... they insisted we take a ride and "raise the roof", which we of course could not pass up! I doubt they will be at every movie, but they definitely made for a wonderful first impression. Jonny and I are already planning our next movie date and can't wait to try the full dine in movie experience. If you saw my instagram post last week, then you know that the weather was INSANE so getting dressed last week was a little interesting. I went with this new favorite, lightweight top ($16) (also comes in white)! I have worn it with these white jeans ($59) and these navy shorts ($125) too! And I wore my favorite OLD sailor trousers, so I am sorry to say they are out of stock, but I found a very similar pair here ($35) and here ($40). What great movies have you seen lately? Would love to hear your recs! This is a sponsored conversation written by me on behalf of Alamo Drafthouse. The opinions and text are all mine. My mom's birthday is a couple days before Mother's Day and this year I wanted to surprise her with something extra special. 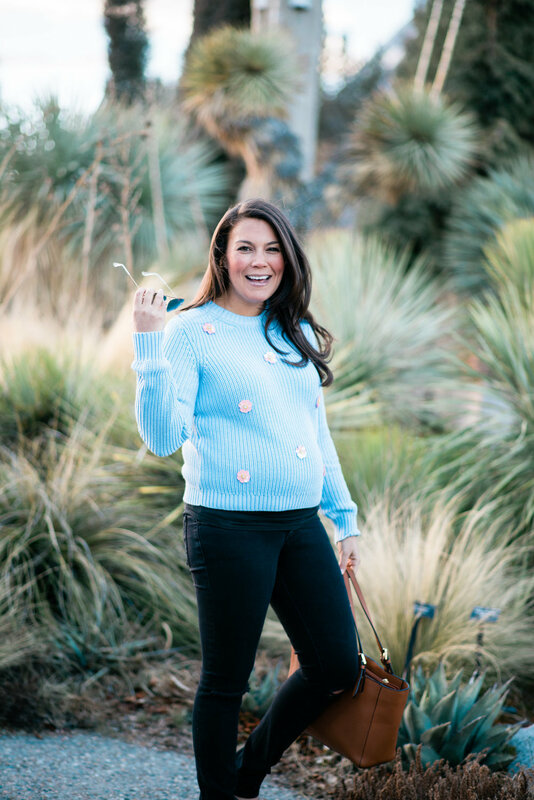 My momma has always been my best friend and biggest style inspiration and I know she would love a great spring sweater set (like this vacation ready one - only a few sizes left!) or summer scarf (like this one!) any day of the week. But when I was scrolling through Minted's site for artwork the other day this personalized foil recipe card jumped out at me and I couldn't stop thinking about my grandmother's banana bread. When I think of my grandma. I think of the way her house always smelled like a bakery when we walked in. She was always making something yummy and was well known by her neighbors for her baking, in particular her banana bread. I keep her recipe card in my kitchen to keep her close and when I saw the option to customize, and frame a recipe card, I knew that would be the perfect gift for my mom this year (I have instructed her not to read this post until Monday in case you were wondering). It was super simple and you can still order one in time for Mother's Day, but will need to select expedited/rush shipping. Right now, they are also offering 30% off graduation announcements with CODE: GRADMORE30 through 5/15. I had originally put this adorable recipe book in my cart for my mom, but after finding her Minted print I ended up getting it for myself (oops!). If you caught my IG Story over the weekend, you may have noticed that I attended two baby showers and a birthday. And my favorite way to organize gifts recently is to package several items together with a fun theme. For instance, I would package this candle (25% off with code mom17) , with this book, some toffee, and these jammies for a relaxing theme. Or this adorable mug, with this tea pitcher, an assorted tea tasting chest with this monogrammed journal for my nana because she loves tea and journaling (like me!) to start her day.